The robot weighs 144 kilos. A robot, model SAR-400 android, is destined for the International Space Station (ISS) as helpmate for Russian cosmonauts aboard. Scientists have started testing the first Russian robot designed to work in outer space. Russia is planning to send its first android robot, SAR-400, to assist Russian cosmonauts aboard the International Space Station. The robot is currently undergoing tests at the Gagarin Cosmonauts Training Center near Moscow. Plans for its future were announced by Oleg Gordiyenko, science directorate deputy head at the Yuri Gagarin Cosmonaut Training Centre Research Institute, announced on Thursday at a space industry conference. "It's to perform operations both aboard the ISS and outside," he said. "Scientists' plans envision introducing robots in manned cosmonautics. This is a promising avenue of research for coming years." So far, the robot can perform the tasks that are simple yet involve risk for crew, such as inspections of the station's outer surface for possible damage and subsequent repairs, the center's deputy director Oleg Gordiyenko said at a conference on the development of space rocket equipment and aerospace engineering training. In particular, SAR-400 can be used for visual inspection of the spacecraft to assess damage and conduct repairs. 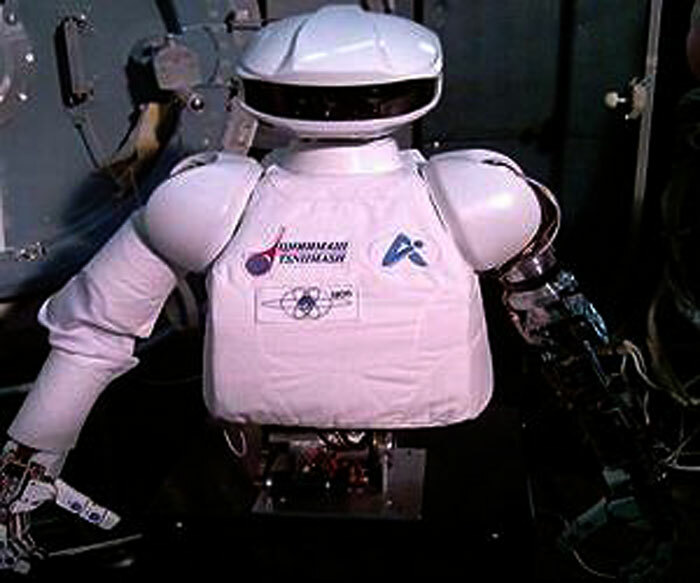 The anthropomorphic robot, SAR-400, was developed by the Scientific-Production Association Android Technology. It has two robotic arms that end with five "fingers" and uses some technologies developed in the former Soviet Union for the Mir space laboratory and Buran space vehicle. It will set out for the ISS within the next two years and may also be used during potential future missions to the Moon and Mars, Gordiyenko said. The robot is 144 kilos heavy. Controllers plan to loft the android to the ISS within two years to partner a US robot already there. Future destinations are likely to be missions to the Moon and Mars. Soviet-era technologies have been put to use in developing the machine-man. Its manipulators have their roots in the Russian Buran shuttle programme and the pioneering Mir space station, now junk beneath Pacific waves since its work was brought to a close.